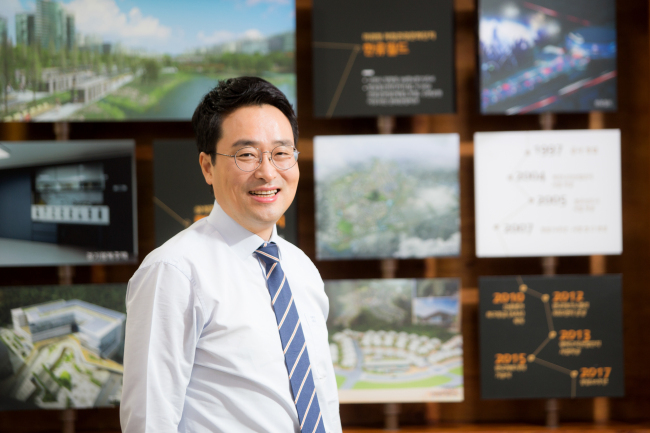 Lee Heon-uk, the newly appointed CEO of the Gyeonggi Urban Innovation Corporation, has mapped out three management strategies: expanding the housing supply, creating better conditions for job creation, and governing GICO as an innovative and responsible body. Lee believes urban planning and engineering should be approached as means of solving problems that stem from flaws in the nation’s social structure. With those concerns in mind, Lee’s ultimate ideal in housing policy is to establish a mass supply of affordable housing. According to Lee, the heart of the current housing problem lies in the sales-centered system, which forces the government to rely on the private sector when it comes to the housing supply and how to utilize the profits from development projects. Lee’s first and foremost solution is boosting the supply of rental homes. This is because fewer people are looking to buy homes these days, whereas demand for rental housing is constantly on the rise. Lee sees a need to upgrade the quality of rental homes as well. He hopes to change society’s perception of public rental housing as “cheap” and made from inferior materials. “We will make our best efforts to make sure that ordinary, middle-class people can enjoy living in premium-quality homes for at least 20 years, paying a small amount of rent rather than interest on a loan,” he said. Lee also plans to do away with the current system of apartment presales, where buyers purchase homes before construction starts. Regardless of the ongoing controversy, starting in 2020 GICO will put its apartments up for sale only after a construction project is significantly underway. This plan faces fierce opposition from construction companies, which perceive the new system as one that shifts risks to them. New apartment blocks in the young neighborhoods of Dongtan, Hwaseong, and Gwanggyo, Suwon -- slated to break ground in 2020 -- will be the first experiments with the new system of post-construction sales. Lee further intends to build mixed-use complexes at major transport centers as a way to support talented entrepreneurs in their 20s and 30s. This project, he says, would not only help to address housing issues, but could also be a breakthrough in the unemployment crisis. “We plan to build at least three 50-story startup clusters adjacent to subway stations,” Lee said. “These will be work-residence complexes where young people can sleep, play and work in the same place,” he said. Lee also welcomed the disclosure of original unit prices for real estate, another revolutionary change to housing policy in South Korea. GICO will be disclosing the original prices of its apartments. “Real estate transactions are made upon the land, which is public property. The people have a right to know exactly how much money has been invested into the land,” Lee said. Over the long term, Lee plans to broaden GICO’s influence overseas. The organization also has plans to undertake urban regeneration and revitalization projects and to introduce smart city features, as well as new forms of rental housing. Apart from “innovative,” “impartial” and “customer-centered” are two other keywords Lee stresses as the leader of GICO. Lee said he will make sure that profits from land and housing developments are distributed fairly, and that at the same time he intends to focus on solving housing problems facing the middle class. In speaking about changes to the organization, Lee said he will bolster both the public and corporate aspects of GICO. “By strengthening the corporation’s core competencies, we strive to enhance our self-innovating capabilities and to carry out the innovate policies (decided) by the government,” he said.